Iain Glen is a Scottish film and stage actor. 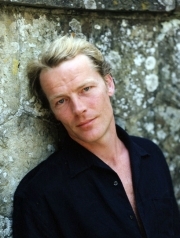 Iain Glen was born in the City of Edinburgh in Scotland, and educated at the Edinburgh Academy, an independent school for boys (now co-educational) in Edinburgh, followed by the University of Aberdeen. He then trained at RADA in London, where he won the Bancroft Gold Medal. In 1990, Glen won the Silver Bear for Best Actor at the 40th Berlin International Film Festival for his role in Silent Scream. It was announced on August 20, 2009 that Glen would star as Ser Jorah Mormont in the HBO series Game of Thrones.. He appeared in the second series of Downton Abbey as Sir Richard Carlisle, a tabloid editor who is a suitor to and subsequently engaged to Lady Mary. Iain Glen is the younger brother of Hamish Glen, theatre director, artistic director of The Belgrade Theatre, Coventry, and formerly artistic director of the Dundee Repertory Theatre. He was married to Susannah Harker from 1993 to 2004; they have one son, Finlay . He is now married to Charlotte Emmerson and they have a daughter Mary . Whole or part of the information contained in this card come from the Wikipedia article "Iain Glen", licensed under CC-BY-SA full list of contributors here.